The interior of the 2018 Compass comes with the Uconnect infotainment system. With this system, you have easy access to Bluetooth, Siri, navigation, and Voice Command. You can enjoy the infotainment system on a vibrant 8.4-inch touchscreen. In addition, you can also enjoy the available heated front seats and a heated steering wheel that are beneficial on cold days. 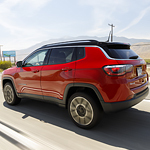 We invite you to visit us at Allen Samuels CDJR of Oxford to learn more about the 2018 Jeep Compass.